Max offers speed, accuracy, and safety with your pharmacy team in mind. We build Max to give you time and free resources for patient care and running your business. Parata counting technology and air-jet cells ensure an accurate count with new benchmarks for speed. Max’s low-touch operation is largely attributed to its ability to cap, its capacity and overflow bin, and the exception carousel. Our two-sided design separates inventory and dispensing. Max continues to run while you replenish vials, caps, and drugs. Easily calibrate cells on site, avoiding costs and delays of cell exchanges. *Parata automation uses barcoding to verify a match between the inventory bottle NDC, unique to medication and strength, and the barcode on the dispensing cell. 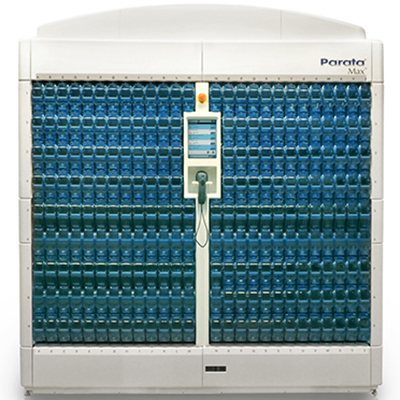 Parata automation selects the correct cell for dispensing 100 percent of the time, ensuring accurate drug and total dosage when proper processes are followed by the pharmacy. Parata assesses your drug list to determine the optimal cell configuration for your pharmacy, such as how many super cells you need and suitable locking cells. Max can be configured for lower volume pharmacies or tight spaces. Your sales director can work with you to review options for the right fit. There are variations in vials, and we fit your Max with the components suited for 2 different sizes of your Tri State, Berry, and Centor vials and caps. Durham is home of Parata’s headquarters and serves as the center of our manufacturing operations. Each of our vial dispensing robots is made here by a team committed to your pharmacy’s success and the role our robots have in the health of your patients. What Is It Like to Be Powered by Parata? With Parata Max filling the bulk of prescriptions, our technicians are free to engage patients through regular care calls. The service Parata provides is very good. We never had any issues. When it came to making the decision, service was definitely a factor.